Another day, another before-and-after. My favorite! This project is one of my favorites OF ALL TIME, with one of the BEST clients known to man. She has a clear vision of what she wants, and trusts me completely to help her make that vision come to life. She wanted to work on that master bedroom....we had just recently completed a full remodel of their master bathroom, so the bedroom needed to match the WOW factor. My client wanted to stick with a neutral color palette, sophisticated bedding, new furniture, cozy drapery, and a new built-in cabinet. This built-in needed to incorporate practical storage, since she wanted to get rid of their dresser and armoire, but also house the TV and AV equipment. As you can see, this bedroom was LARGE - and honestly lacked furniture of the correct scale. We needed to select new furniture pieces to help visually fill the voluminous room. 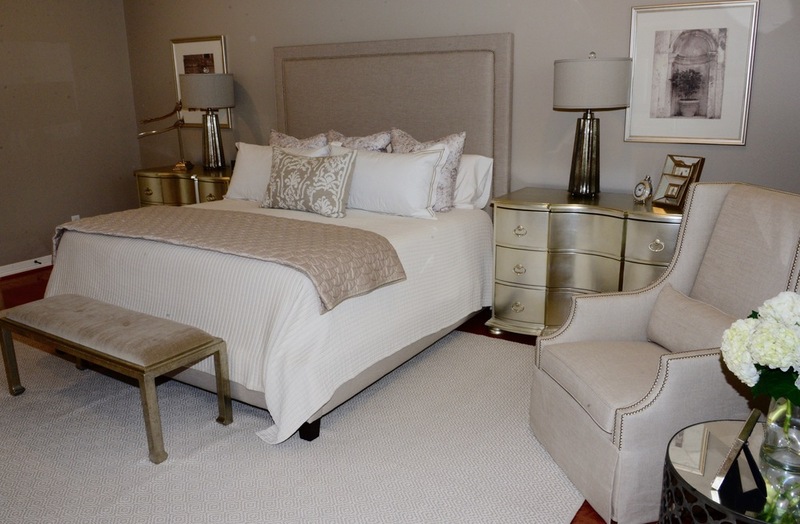 Upholstered Bed: This was the piece my client was the most excited about. She loved the look of an upholstered headboard, and this tall bed was the perfect way to warm up the wall, and the antique silver nailheads introduced a dose of charm. The neutral fabric will be easy to work with for years to come. Nightstands: My main objective was to find nightstands that were large enough to visually fill that massive wall! They also needed to have drawers for access to bedside items. These stunners in a beautiful metallic silver leaf finish are statement pieces by being so elegant and refined. They are sized perfectly for this space - 4' wide - that is a ton of storage! Lamps: Decorative lighting is such an important aspect to any interior, and these sparkling lamps are no exception. The antiqued silver finish is refined and glamorous. Upholstered Armchair: To create a cozy feeling in this room, I knew that a small reading area next to the windows would be the perfect touch. This chair from Bernhardt has a nice high back, and swivels for easy TV viewing. Keeping in the neutral color scheme, we selected a soft linen fabric. Bench: Have I mentioned this room is very large? A bench at the end of the bed is the perfect spot for putting on your shoes, and the finish is a great visual contrast next the to light color of the bedding. Area Rug: Finding an affordable, durable, yet beautiful rug that is 10' x 14' is no easy task. This gorgeous textured rug is from Dash & Albert. The subtle pattern works beautifully with the elegant items, yet keeps the room feeling grounded and cozy. There is nothing better than stepping onto a lush rug when getting out of bed. Drapery: This room is full of extremely subtle patterns and textures, so the window treatments was the opportunity to introduce a bolder pattern. This striped fabric is sheer and gauzy, and the tone on tone stripe is bold but still cohesive with the rest of the room. Built-in Cabinet: This built-in is my absolute favorite element in this entire room. Seeing this custom piece come to life from our initial drawing was so much fun. We incorporated 2 niches for these gorgeous sconces to create depth and visual interest. And talk about storage - this cabinet has enough drawers to hold everything imaginable!